The spatial layout of Bedouin villages reflects their organic development within the geo-political realities that influenced them over time. Although there are differences between the villages and even within them, all have common features of spatial distribution arising from their shared principles of traditional social organization. These principles include a social order that emphasizes the centrality of the family, its land ownership, gender separation, and maintaining privacy in its various aspects. Of the Bedouin villages in the Negev, only 12 (one of them just recently in 2014) have been recognized by the government. The government planning process for the recognized villages has largely ignored their spatial reality and its logic. 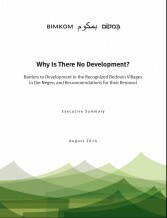 In practice, only 128 residential building permits were issued in only two villages. A decade after the establishment of the Abu Basma Regional Council, the development of infrastructure in its villages is minimal. Thousands of homes (built without permits) and many of the public buildings are not connected to basic infrastructure such as electricity and water, and in most cases, there are no roads to them. The State must internalize that the transition from non-formalized settlements to regulated localities must be gradual, so as not to undermine the foundations of Bedouin society. This understanding must precipitate the necessary flexibility of planning concepts, of the general approach of the authorities, and of planning and development policy. Israeli society stands to benefit from the strengthening and development of the Bedouin villages, provided that this development occurs at a rate and in a manner appropriate to their residents. 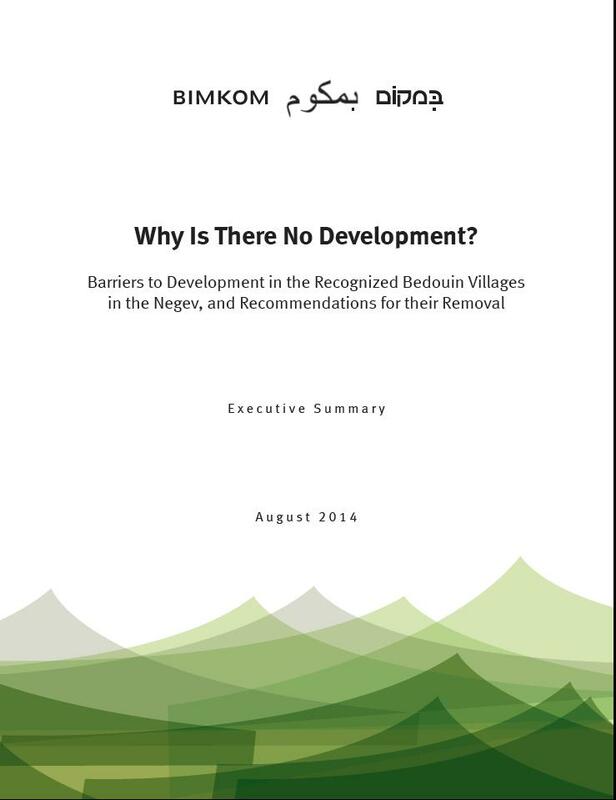 This entry was posted in Publications, Publications and tagged Bedouin, Bimkom, Building Permits, Demolitions, Development, Negev, Planning, Recognized Villages. Bookmark the permalink.